Kaylie Snow has always been the fun, flirty, pretty sister. Now her burgeoning baby bump, hormone-infused emotions, and faltering singing career are sending her into an unexpected identity crisis. Watching her older sister, Danica, glide through a major career change and a new relationship with the grace of a ballerina, Kaylie's insecurities rise to the forefront - and her relationship with fiancé Chaz Crew is caught in the crossfire. Chaz Crew has everything he's ever wanted: a lovely fiancée, a baby on the way, and soon the film festival he owns will host its biggest event ever. When he's called away to woo the festival's largest sponsor - and the lover he's never admitted to having - secrets from his past turn his new life upside down. With her baby shower around the corner and her fiancé's big event looming, the pressure is on for Kaylie to pull herself together - and for Chaz to right his wrongs. In a few short weeks, the couple who had it all figured out will learn things about life and love that may change their minds - and their hearts. 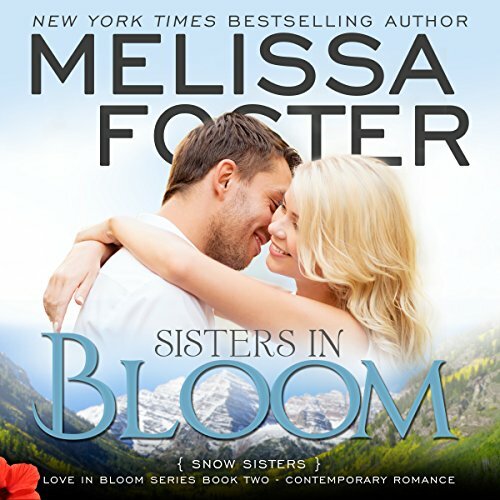 Sisters in Bloom is part of the Love in Bloom series. 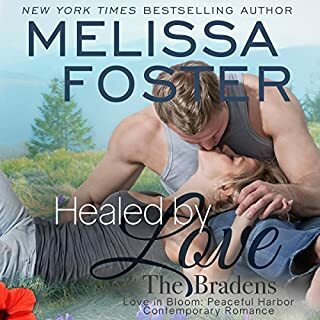 While Sisters in Bloom can be listened to as a standalone novel, for even more listening enjoyment you may want to listen to the entire Love in Bloom series in order. This Series is so good!! I love it so much!! The characters are Great the book flows SO WELL & the Narrator B.J. HARRISON BRINGS THE BOOK TO LIFE!! 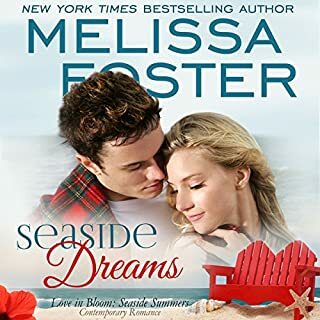 Melissa Foster is AN AMAZING AUTHOR!! I CAN'T WAIT FOR MORE OF HER BOOKS!!! Fast forward a bit, and we have Kylie’s story as she navigates through pregnancy hormones, a slowdown in her own career and a bit of a rough patch with her fiancé, Chaz. Not a particularly introspective character, all of these changes have Kylie worried about EVERYTHING, and the doubts are creeping in. Chaz has a big film festival coming up, and he thinks his life is going along beautifully. Nothing is better than his fiancée and new baby on the way, and this film could mean big things for them all. But the one regret in his life has suddenly reappeared, and the existence of this woman isn’t something he ever shared with her. Now with Kylie at a low point, a past fling that won’t stay that way and the stress and nerves around the film festival and things are just heating up. Foster uses a combination of character development, communication and fears that are very real, if sometimes groundless, to build the story and give it teeth. Chaz is a wonderful and steady influence for Kylie, and while their love is obvious they both cling to insecurities and issues from their pasts. Insets from Danica (Kylie’s sister) and her relationship trials in her own life, and the visit from her mother all play to the issues both of the sisters have in their own lives. Issues that their mother’s influence (and some actual common sense) allow them to move forward in their own lives, allowing the past to settle. Narration is provided by B.J. Harrison, and as I thought with the first in this series, a clever choice of narrator. There is a bit more angst and tension in this story, and Harrison’s ability to present the emotional overtones in the story without overreach or overacting. While character voices are distinct, they do not tip over the line to caricature or overly emoted, and the story is richer for that. A great installment in the Snow Sisters series, I’m curious to get to the weddings.. I received an audiobook copy of the title from the publisher for purpose of honest review. I was not compensated for this review: all conclusions and expectations are my own responsibility. This is book 2 and I do have to say it is even better then book if that is possible. Kaylie and Chaz are an amazing couple, they will make you laugh and cry and in the end you will route for them to have a happy ever after. Danica and Blake also make this book perfection I love the advice they both give to the new couple. Snow Sisters at it again! 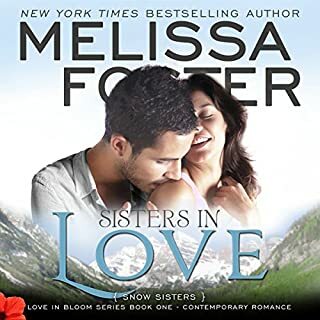 This is the second installment of the Snow Sisters by Ms. Foster and picks up right where we left off in Sisters in Love. Follow along as you read about the strength that Kaylie shows as she progresses through her pregnancy, Danica learns to never underestimate her sister. This novel also tackles the difficult relationship between a mother and a daughter and at the end see the bond that exists only between a mother and a child and transcends all issues. Danica and Blake have some issues they have to address and it provides an opportunity for headstrong Danica to learn from her sister and those around her. I absolutely LOVED the reading by Mr. Harrison and cannot wait for the next installment of the Snow Sisters! There was much growth and maturity to the characters from the first installment to this series. I fell in love a bit more with two of the four main characters and then I began to understand one chacter a bit more and the fourth was almost a new face. There was a deeper dive into emotional drama and a few other things that raised the bar for thg is addition to the series. This is the second book in the Snow Sisters Series. I loved this story. Kaylie and Chaz are great together and I loved to follow them in their journey. This is a sweet, fun and emotional story. I love the ending. I also loved to see Danica and Blake from the first book. You can read this book as a standalone, but because of the characters intertwined, you'll better appreciate your listening if you read the first book in the Series before. I received this free review copy audiobook at my request and I have voluntarily left this review. This is book 2 of the Snow sisters romances. The story revolves around their growth and emotional development. There is also a fair amount about Danika becoming more sensitive to Blake’s feelings and Chaz and Kealy learning to communicate. Very much moving the series along with the introduction of new characters. All characters had a way to go in growth. This is a complicated romance and good choice for the Romance Package. The narration was ok but could be improved. Sisters in Bloom (Story Sisters #2) focuses on Kaylie, but there is so much more to this book. I loved all the scenes where we catch up with Danica and many other characters. Even though it can definitely be read as a standalone (as can all of the books by this author that I’ve read so far) these Snow Sisters stories read more like a connected series. I love that with the overlap of storylines in this series we really get to watch so much growth with these characters. I love listening to these books on audiobook. The narrator adds another level of enjoyment to my reading experience and makes my long commute seem like nothing! I listened to the audiobook and was not disappointed. Once again with the mix of Melissa's compelling writing and B.J. Harrison's narration, he seamlessly switches characters with ease and pulls you into the story. Kaylie Snow was the pretty sister, the good-time girl with a singing career who never had the pressure that her parents put upon her sister Danica, whom they expected great things. When Kaylie meets Chaz Crew, producer of a local film festival sparks fly. Now pregnant and trying to find her way when her singing gigs virtually dry up, she's having a very difficult time coping. Add in baby hormones and watching from the sidelines as her sister handles changes in her life with grace and ease and it throws Kaylie into a tail-spin that threatens her relationship with Chaz. Unsure of herself for the first time, insecurities rise to the surface. Chaz has his own issues to deal with. He loves Kaylie, looks forward to their baby and is preparing for his biggest festival ever, when one mistake from his past threatens everything. With so much at stake for both of them, this book follows their journey through the murky waters of secrets, sins of omission and trust that need to be dealt with for them to find their happily ever after. We see Danica and Blake, get to know Max a little better and learn that love is seldom an easy road to navigate for most of us. This is the second book in the Snow sisters series. It mainly focuses on Kaylie and Chas's relationship as they approach parenthood. In between the story is the growing relationship between Danica and Blake as they head towards living together. Add in the side characters of Gage and Sally it makes for a great listen. Sometimes Kaylie comes across as a whining teenager, but as you get further into the book you realise she lets her past control her future. BJ Harrison is a great narrator. This is a standalone book but follows on from Danicas story. It explores lots of emotions and Kaylie is just as flawed as the rest of us. The same can be said of her other half Chas. Definitely one to listen to.